Elemental: A sentient being made from one of the four basic elements, which in Greek philosophy were earth, air, fire, water, and water. (I know, quintessence was added later). Elf: Elves have been included in many European mythologies, and taken many forms. Earlier forms were often malevolent, but later became associated with grace and beauty. The modern view of elves tends to come from Lord of the Rings, in which the Elves look much like humans but for their pointed ears. Yet they live much longer than humans, and have supernatural grace and beauty. Elves in Elf Mastery are closer to humans, with similar lifespans and flaws. It was an elf, in fact, who invented humans. Legend says that a lonely elf hermit, an animal designer, took an ape and refashioned it into a mate, and from their children sprang the human race. Elves of course claim this tale is ridiculous. Nonetheless, they are credited for the creation of the human race, an animal both revered for its intelligence and reviled for its behavior. Physically elves are similar in size to humans, though they tend to be somewhat smaller and more slender. Their most distinctive feature which separates them from humans is their pointed ears. 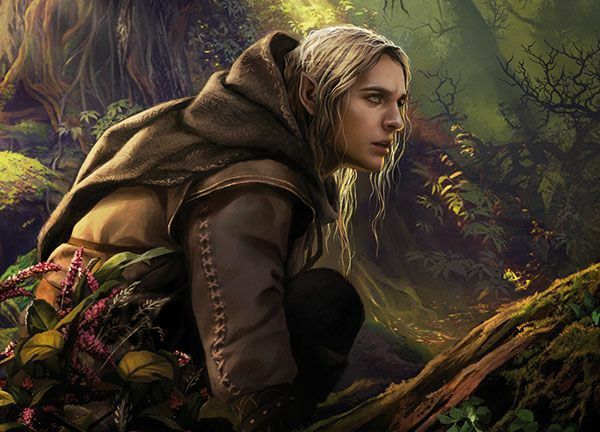 Yet despite the similarities, and evidence of human intelligence, Elves consider humans to be animals and classify them among the lower order of creatures. Elves are considered the guardians of the forest, though there are many elves who have expanded into other spheres. Elial Ciana (Professor): (ee LIE ull * see AN ah) Elial Ciana is Dean of the Communications department at Equinox. He is a middle-aged elf, with long dark hair with light streaks of silver. As Equinox frequently undertakes contracts with the Royal Army, Elial has access to many top secret communications which he must keep secret from his own boss, Director Anh-Bul. Elial is in fact the go-to contact for both the Royal Army and Oberon himself on matters regarding Equinox, as he is viewed as more competent and easier to work with than the Director. Elk’s Crossway: A small town of mostly elves, though has a sizeable population of gnomes and dwarfs. It is the last carriage stop before Equinox when headed from Aspengrove. Elson: (ELL sun) A satyr from Rava's Glen in Arkwood. Elson spends much of his time cavorting with the alseids of Arkwood, and for a time tried to woo Eunoe. However, his obscene and aggressive advances tipped the scales that led Eunoe to mistrust satyrs and males in general. He is violent, and has a temper, yet his alpha personality gives him a powerful influence over the other satyrs and alseids. Elvingaard: (ELL vin gard) The Elvingaard is an army of Elf soldiers who were sworn to protect the King of a once-great Elvish nation. After several generations of peace, an evil heir took the throne and began to oppress the people. (Many common folk mistake this for the same King opposed by Kinsel King, but they are mistaken). The Elvingaard broke their vow and turned on the Royal Family, killing the King and his brothers and chasing their wives and children from the palace. The Elves chose not to appoint a new king, but rather broke into smaller, independent communities. The Elvingaard remains to protect them, with each community sending a number of their finest to serve in the Elvingaard in ten-year tours of duty. The Elvingaard answers to no one community, but is vowed to protect all of them. Emona: (ee MOE nah) A female elf in Aspengrove. Neighbor to the Nim family. Emona's husband Vendrik is a retired officer of the Elvingaard, though he is still often called in as a consultant. Equinox: (EE kwin ox) A university-type school funded by the King and Queen. Originally begun as a trade school for refugees and others with no home kingdom or clan to turn to for training, it has expanded to include anyone who wishes to walk a path outside their homeland. Many of its students are those who feel they don't fit in to their own cultures, or for some benign reason are persecuted. It is seen as one of the most diverse locations in the World of Order, save High Haven itself. Other schools have sprung up with similar training and objectives, but these are funded by smaller kingdoms. Equinox remains the Royal Standard. The statues of King Oberon and Queen Titania that constitute the Golden Gate have become icons of academy and education. Equinox currently has over twenty thousand students, though many of these are at off-campus locations for field training. Equinox is also one of only three locations in the world that lead to the Center of the Earth. Erchagh: (ER kog) An earth elemental who pushes the great wheel that spins the earth on the axis. A member of Heff's crew. Erebus: (ERR uh bus) In Greek mythology, the god of darkness and son of Chaos. In the Greek myth he fathered many deities through his sister Nyx. This is not the case in Elf Mastery: though they are siblings, and children of Chaos, their relationship is one of brother and sister. While Erebus has no preference for Chaos or Order in itself, the light of the sun and stars is a constant torture and he has sought for millions of years to put an end to the light. A series of failed attempts convinced him he needed to awaken Chaos to destroy the World of Order altogether, though he had no means to do so. His sister Nyx, able to read the minds of the desperate and hopeless souls who guard the star stations, suggested they bend those minds to help them seek the tools they needed to douse the sun and stars and take back their home. Though it has taken a long time, Erebus' plan to retake his home is finally in motion. Eunoe: (YOON way) An alseid from Arkwood. Eunoe lives across the hall from Kyla Nim and Aura in Haven Hall. More introverted than the other alseids, Eunoe has long felt out of place, and her habit of keeping to herself has long made her unpopular with the other alseids and the satyrs with whom they spent most of their time. After an assault by the satyr Elson, Eunoe was shamed by her community who decided to side with Elson. Wishing to get away from the gossip and harrassment, and satyrs in general, Eunoe and her close friend Aspen (to whom her soul is tied) decided to go to Equinox. Though she comes across as bossy and controlling, and a bit of a misanthrope, Eunoe cares deeply for her friends. Her maternal instinct is very strong, and she often sees her friends as her children. Her great mistake is that she often treats them as children, and doesn't understand why this causes them to react negatively. Regardless, her friends often see her as the strong core of the group, and the one who will step in to support them or protect them from harm. Eunoste: (YOO no stay) The Doyenne of Arkwood, or leader of Eunoe's Charm. Eunoste is far and away the oldest of the alseids in Arkwood, and rumor is that she is older than the woods itself. She lives in a tree home of wood shaped by dryads, a very rare and unusual dwelling as dryads almost never work together. Like Eunoe she is more solitary than the other alseids, though due to her rank and power they don't harrass her the way they do Eunoe. Eunoste has the ability to weave souls, and saved Aspen by tying her soul to Euoe's when Aspen's link to her mother tree was severed during a forest fire. Exema: (EX em ah) Goes by Exa. A gnome woman and one of the Royal Blacksmiths in High Haven. Short and solidly built, she is perpetually covered in soot and ash but always smiling. She is a hard worker and spends little time in recreation or socializing. Though she is quite capable of making weapons and armor, most of her work focuses on making hammers, nails, and other tools. She is the daughter of Inda.